Beyond the classroom experience, you’re probably wondering what life will be like at LBC. Where will I live? Eat? Gather with friends? What activities, sports, or clubs are there to get involved in? Here’s a glimpse into life at LBC. If you need more help, contact studentaffairs@lbc.edu or call 717.560.8240. Academic Degrees: Learn more about the exciting degrees offered at LBC. Admission Requirements: Useful information about steps you’ll need to take before applying for the undergraduate program. Preview the Campus: Here are several ways to experience live on the Lancaster campus. Get your response by email, phone or text. 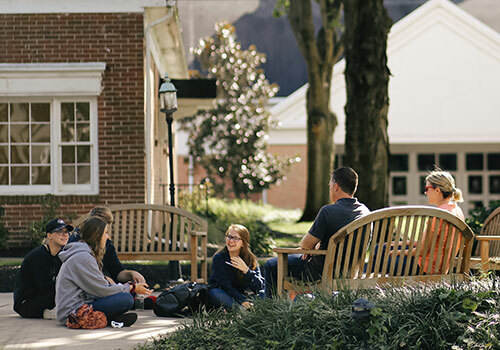 Spiritual Life Learn about how chapel fits into campus life and and the service outreach programs that impact the LBC community and the community outside our walls. Activities & Clubs Get involved in student government, choir, contribute to our student publications, audition for a play or musical, join a intramural sports team and more. There’s something for everyone at LBC! Housing Learn more about the life and atmosphere in the residence halls and which one might be right for you. Arts & Culture Enjoy the rich diversity of Lancaster County – from beautiful farmlands, shopping outlets, parks, unique art galleries, theaters (like our very own Trust Performing Arts Center) and a diverse restaurant scene. Health & Wellness Our Wellness Center promotes wellness, healthy eating options and exercise for students at LBC. Athletics We offer 13 men’s or women’s NCAA Division III intercollegiate athletics teams or become a participant in an intramural program. Take a Virtual Tour of the LBC Campus Today!